Spring Picture Day is April 1. Those who are getting spring pictures taken may wear appropriate dress clothes rather than their regular school uniforms. Remember, all clothing must be modest and appropriate according to TCS standards. Boys: Dress pants and dress shirts (polos or button-up shirts) Girls: Dress pants and dress shirts/blouses, dresses, skirts and blouses. 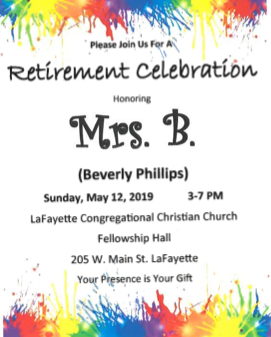 Please join Temple Christian School in extending best wishes to Mrs. Beverly Phillips, who will be retiring from Temple at the end of the current school year. Mrs. Phillips has taught at Temple for 17 years. She will long be appreciated for the incredible art program she has poured her heart into here at TCS. We would like to thank Mrs. Phillips for being such an inspiration and blessing to the many students who have taken her class, along with the staff members who had the privilege of working alongside her. 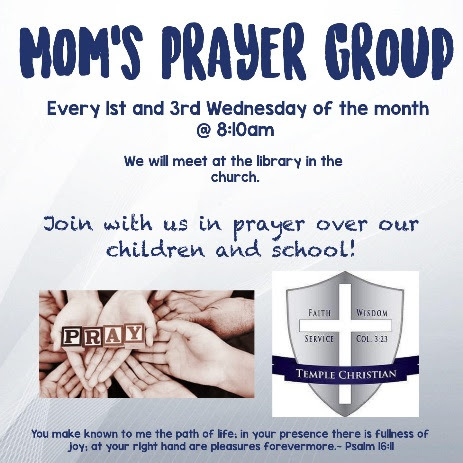 Mrs. Phillips’ testimony, strength, passion, love for her students, and teaching ability will be remembered at TCS. We wish her well in her retirement, and we continue to pray for the Lord’s blessing on her life. Elementary students were wild about reading this month! TCS students read thousands of minutes and enjoyed fun-filled activities each week. We had a blast today during our big reading month finale. Students participated in a variety of activities including face painting, obstacle courses, and Lego challenges. They also enjoyed yummy jungle themed snacks. We are incredibly proud of our students’ hard work in meeting their reading goals. We want to send a huge thank you to our parent volunteers who donated their time and many snacks to make it all happen! A big thanks to Mrs. Cooper and NHS students for providing a hot breakfast for TCS teachers this morning before school. Teachers enjoyed pancakes, eggs, fruit, milk, juice, and coffee. It was a great way to start our Friday morning! 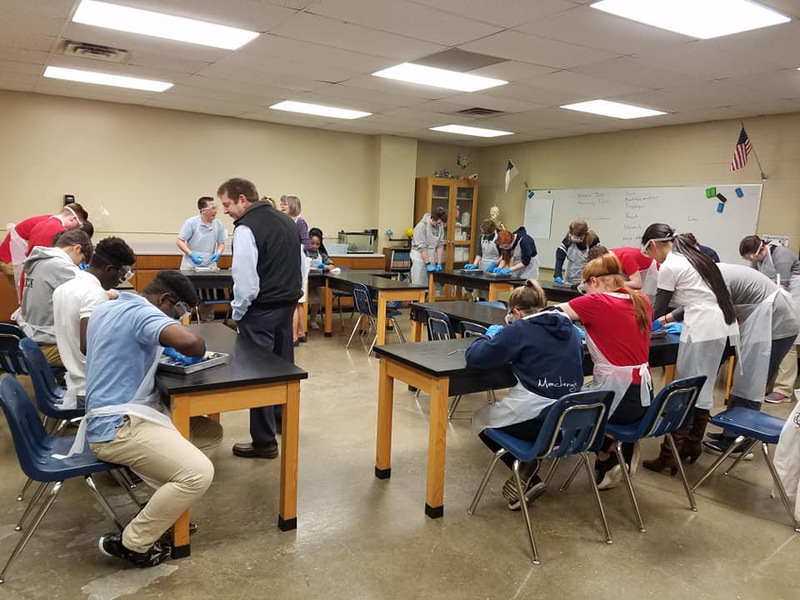 Mrs. Cooper’s 7th Grade Science and Mrs. Stoodt’s 10th Grade Biology classes dissected frogs in an interesting and educational lab experience on Thursday. They were able to identify various internal organs, see frog eggs, and even spot insects inside a few of them. It was a memorable science lab experience! The Converge Youth Conference will be taking place on April 5 & 6 at Elida High School and the Elida Fieldhouse. 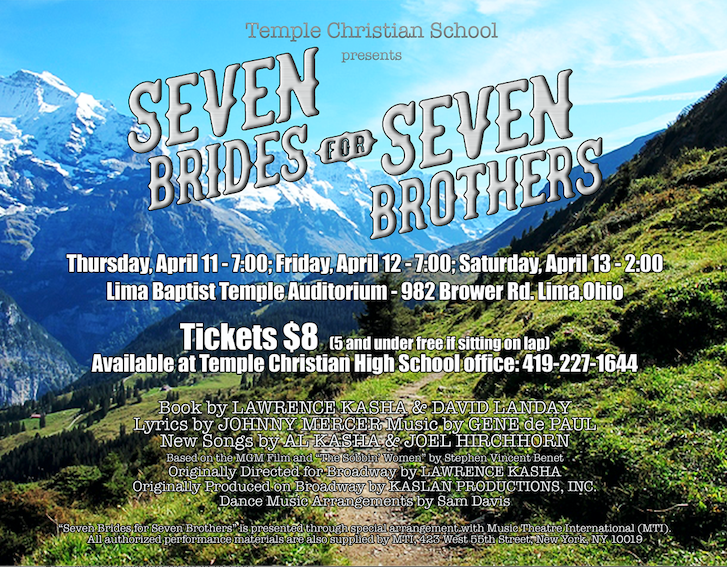 TCS students in grades 8-12 who register for the Conference will be able to enjoy an early release on Friday April 5th at 12:50 P.M. In order to leave school early, students must have a permission slip and proof of Converge attendance both of which are due Thursday, April 4th. 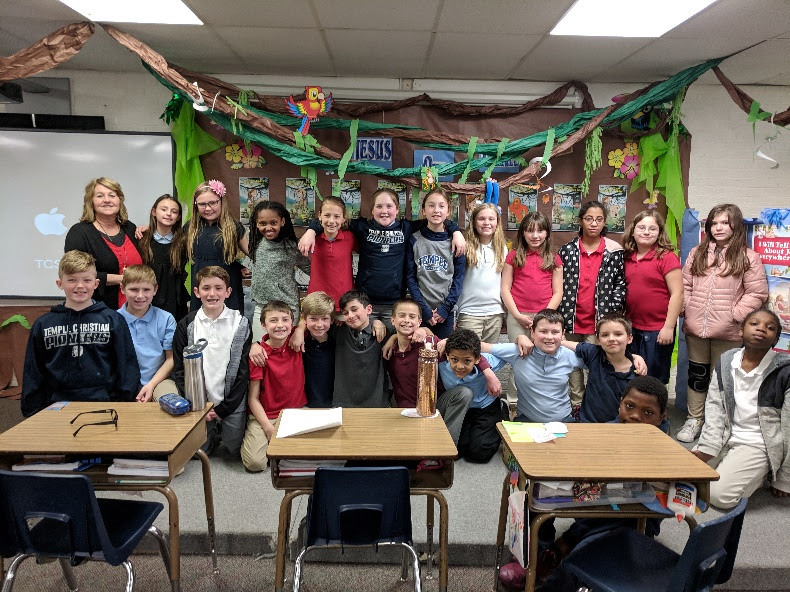 Our Box Top winner for the months of February/March was the 4th grade with a total of 243 Box Tops! They were treated to a special spring treat during the day on Wednesday! We appreciate their willingness to contribute to this special project. The money that we receive from the Box Tops goes towards new playground equipment for our students. The K4 and K5 art classes had a guest speaker this week in class. They welcomed an artist from the Columbus area who specializes in animal silhouette paintings and sculptures. She explained to the classes how she starts from just a printed picture of a pet and transforms it through many steps until she gets her desired product. 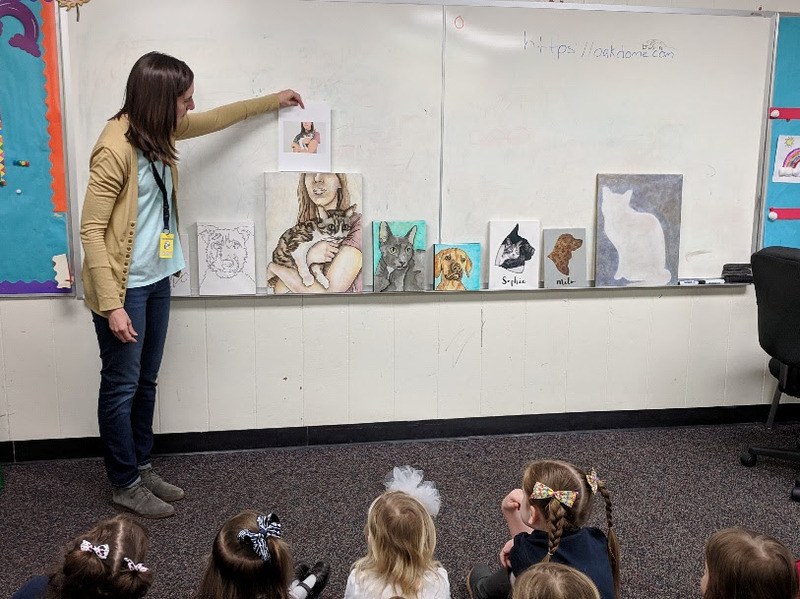 Next week the students will be bringing in pictures of their own pets and we will be doing a painting project similar to the one our visiting artist demonstrated. Please return all re-enrollment materials as soon as possible to help us prepare for the upcoming year. You can save $50 per student if you re-enroll before March 31! You may use the drop box outside the elementary office until 5:30 P.M. today or mail it and have it postmarked by March 31st in order to make the early deadline. Apr. 1 J.H. Track and Field at Continental @ 4:30 P.M.
Apr. 2 H.S. Track and Field at Allen East @ 4:30 P.M.